Gastropub just off City Road near Old Street Station. 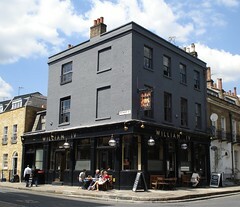 Note: The William IV had a change of management in mid-2010. We haven't visited since, and so our comments below may be out of date. Two real ales — Black Sheep (£2.65) and London Pride — plus a guest ale. The guest ale on a visit in July 2007 was Cains 2008 (£2.65); it tasted a bit funny but not actually off, and we weren't sure if it was meant to taste like that. The Black Sheep was fine though. Kake and Bob visited for lunch on a Tuesday in July 2007. We got there at 1pm and it was fairly empty. The decor is deliberately shabby but in a nice way. Everything's painted white, but it's not really overwhelming. Photos here, here, and here. The lunch menu (photo) ranges from £3.50 (chips with sweet chilli sauce and sour cream) to £9.50 (fish and chips with peas). About half of the dishes look potentially vegetarian, and the apple, celery, walnut and grape salad (£6.75) might even be vegan. The menu we saw was different from the one on the website, and included a seasonal-sounding dish (summer vegetable and herb soup, £4.75), so it looks like they change it about a bit. Kake had the smoked mackerel terrine with caper berries and toast (£5.50); it was more substantial than expected, with thick-cut white toast and generous slices of terrine. The terrine itself was quite acceptable, with nice big chunks of mackerel; it's a shame that it arrived fridge-cold, since it was much nicer once it'd warmed up a bit. The caper berries were tasty too. Bob had the pork and leek sausage sandwich (£8.50 with chips, £6.50 without) followed by the almond tart with double cream (£4.50). Wireless internet access is available (though not tested by us); ask for details at the bar. There are seats and tables outside for the smokers to retreat to. There is also a cat, a piano, and a selection of board games. I assume you're allowed to play the board games, but I'm not sure about the piano. Last visited by Kake and Bob, 31 July 2007. Last edited 2013-05-10 08:16:39 (version 17; diff). List all versions. Page last edited 2013-05-10 08:16:39 (version 17).